Our playthrough continues from here! 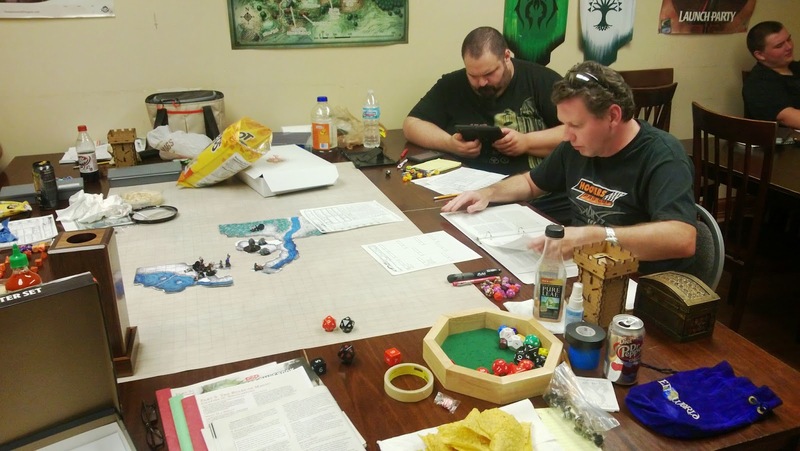 We're having some fun playing through the 5E Starter Set, with some help from the D&D Basic PDF downloads provided by WotC. I blogged last week about picking it up and getting started here. So far it's been as D&D-esque as anything else we've played in that we're certainly approaching like the D&D we regularly play and it's holding up just fine. 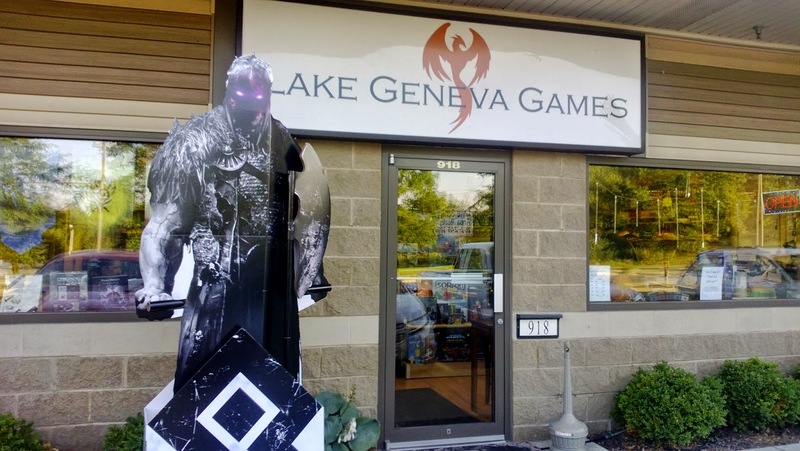 We regularly play at Lake Geneva Games where they have a game room hidden behind a secret door and, as a recent addition, a guardian outside to deter riff raff. 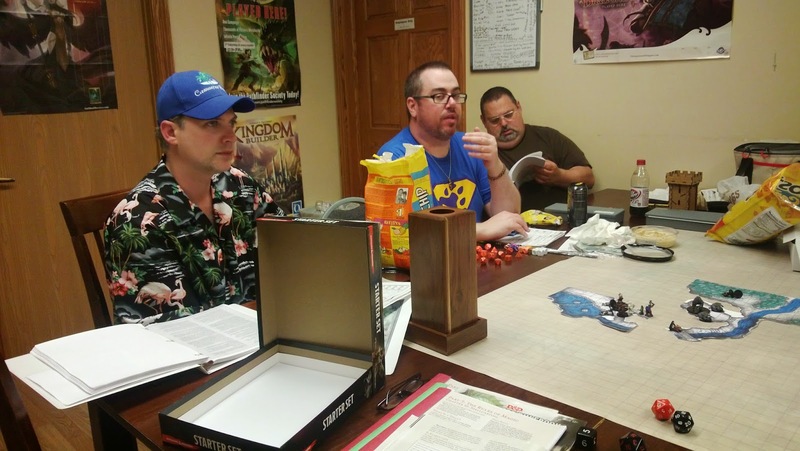 As said in the previous blog post, we're taking a break from a 1E campaign to go through this Starter Set, have a regular Pathfinder player in the group, and, in fact, everyone in the group has extensive experience with all forms of D&D and dozens of other RPGs. There are some interesting differences which I'll discuss after we have worked through the whole Starter Set adventure and wrapped up our foray into this new edition. We hope to be done prior to or just after Gen Con, but we'll see how it goes. We're not dawdlers and we want the full experience of the new rules, to give this new game its best foot forward, but we are taking some diverse approaches beyond the tabletop which I'll explain further in this in future blog posts. Dice towers are beginning to crop up more and more at our table but the complaints about the dice and towers continue unabated. I can't blame the players. The initiative rolls for the "bad guys" have been decidedly good but that only rubs salt in the wounds as the inits for the party have been very low on average. For anyone who printed out the Basic Rules and brings them to the table to help keep us on track, I am giving one re-roll per session. These came in handy for the party late in this latest game. More on that below as well. You'll note we play with miniature figures. It's something I have done almost always, as a wargamer even before the advent of D&D in 1974, and the players all enjoy that sort of play. 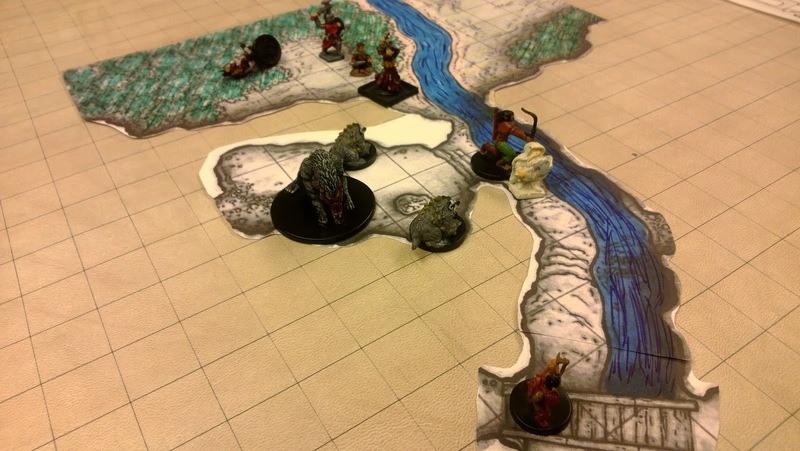 We do have our moments when we don't use any figures, preferring a narrative approach to the game during most NPC interactions, but for combat we certainly find them a useful addition to game play. I wore my Gary Con VI shirt for this latest game though I am not sure the players picked up on the Goblin connection. If they did, no one mentioned it at the table. Perhaps I was subliminally trying to give them a hint. But they had known they were trailing a goblin raiding party so maybe it was just subtle confirmation of what they already knew. From here onward, there be spoilers. So, you players who wish to play the Starter Set adventure without foreknowledge, read no further! In prepping for this game, I was pleased to find out that Mike Schley had set up a sales site for the maps included in the Adventure Book of the Starter Set. He has both GM and player versions of the maps, the former with keyed details and the later scrubbed of those aspects. 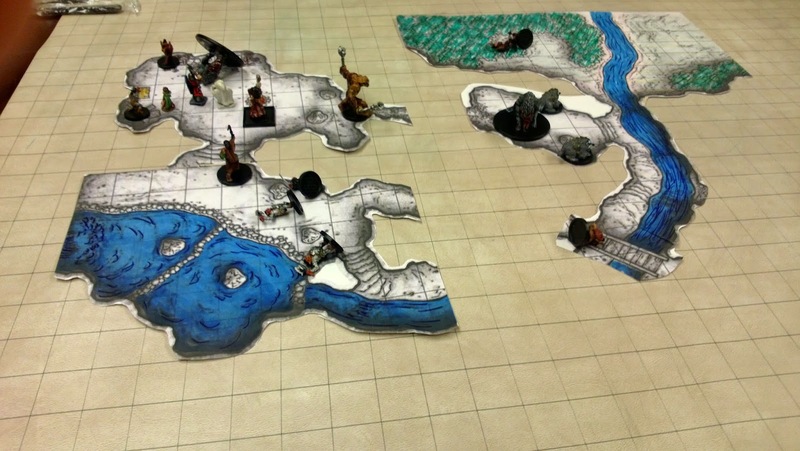 I'm not a GM who hands players a full map of an encounter location, so the player versions aren't useful to me in that way. The GM maps I have in the book, which I could scan for personal use and print if I really wanted a loose copy, which I don't. mI already have a blown up map of Phandalin, so of what is on offer, I grabbed five and might grab the North Sword Coast player version as well. What I like to do is take such maps and make what I call playouts. They are similar to Dungeon Tiles or Flip-Mats or other such aids. I simply take sections of the scrubbed map (it's a time saver not to have to scrub them personally) and use them along the way as the players explore the location. We dealt with the ambush set up mostly in narrative form. 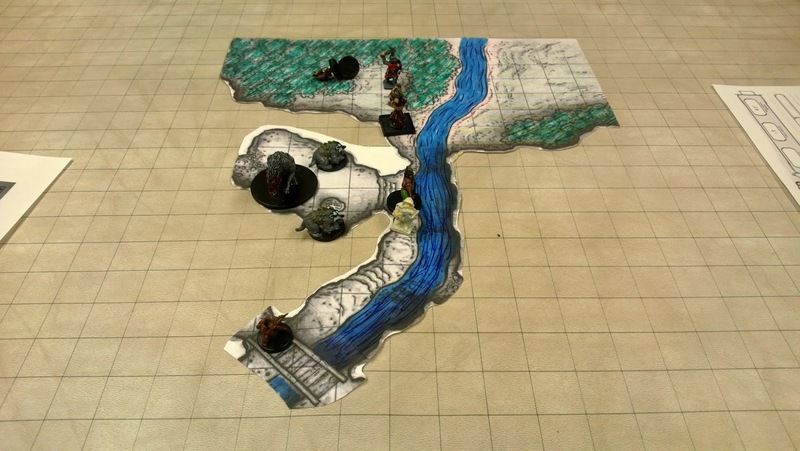 That is to say, except for the players putting minis on the table to give me a marching order for their approach to the Hideout, they knew only what was verbally described. I could have mocked up some playouts to conceal the thicket where the guards were in wait but that seemed like more work than necessary. It is meant to be a quick encounter and it was. 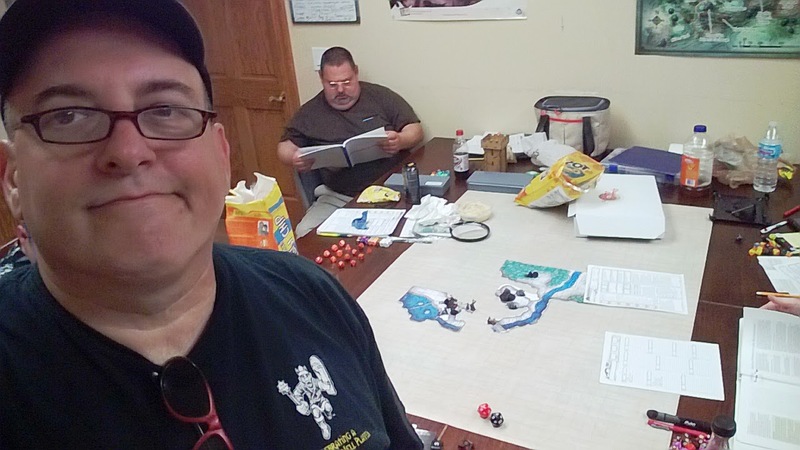 The Dwarf Cleric, who goes by Nox at our table and is played by Norm, used his Animal Handling to keep the wolves busy and the two PCs, one with Darkvision, moved swiftly up the tunnel, spotting the Goblin on the bridge even as they spotted him. The two PCs won initiative, their best initiative luck of the night, and they took out the sentry before an alarm could be raised. I couldn't locate any wolves in my minis for some reason so made due with some substitutes. They worked well enough and I explained to the players what their in-game counterparts were actually seeing. Notice that the bridge was a separate piece. I didn't add that until Nox was in far enough to see it, stated he was looking more intently up the tunnel, and made a successful Perception Check. After farting around with the scree-ridden tunnel but avoiding injury, they split the party, suspecting the tunnel ahead and the tunnel off the one side of the bridge would meet up. The Dwarf, Nox, and the Wizard, Heronimus, were proceeding up the stream tunnel. The Halfling, Bulbo, climbed up to the rickety bridge, followed by the Noble Fighter, Excelon, but when the Folk Hero Fighter, Samuel, attempting his Athletics Check it was a critical failure so I had the javelin they had thrown to secure the rope begin to come loose and they opted not to trust it further. There was no time to re-secure the rope as the Halfling who had lit a lantern was calling for help from point and they all rushed to join combat with the Goblins in the pool room. 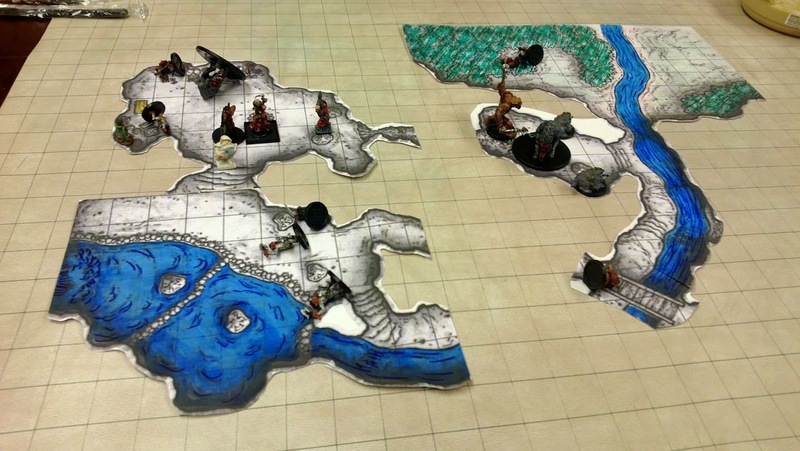 Although the Halfling was wounded, they managed to avoid other injury and make short work of these foes as well. However, they had been spit and yelling orders, so the Goblins here were not surprised nor would the next foes be either. Note that I don't print out absolutely every portion of the complex but allow some gaps between encounter areas. This works fine and saves prep time. 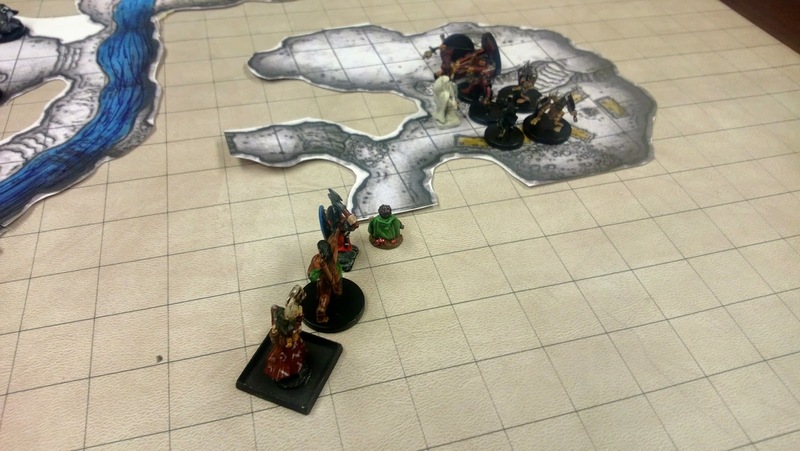 When the party climbed the slope into the next chamber they discovered the wolf (who hadn't yet gone into hiding) standing off in challenge to them. A couple of bow shots and strikes from the Dwarf and Noble took him down swiftly. By the adventure text, this triggers the Bugbear leader to attempt escape, which he would do down the fissure in the following round. But the Halfling moving up to the crates causes the two Goblins to spring into action and this kept most of the party's focus away from the Bugbear. I allowed an opposed check by the Wizard against the stealth of the Bugbear and the Wizard won. He attempted a Sleep spell but it was too poorly rolled for HP and had no affect. Since the Halfling and the Noble were handling the Goblins, I allowed the Dwarf a chance to notice the escape attempt and he did also but by the time he made it over to the fissure, straight through the fire pit and taking a point of damage, his wild swing missed his foe and the escape was successful. They hung tight expecting the Bugbear to collect the wolves and come back around at them but, unbeknownst to them, he failed an Animal Handling attempt and with no immediate support opted to continue his escape. 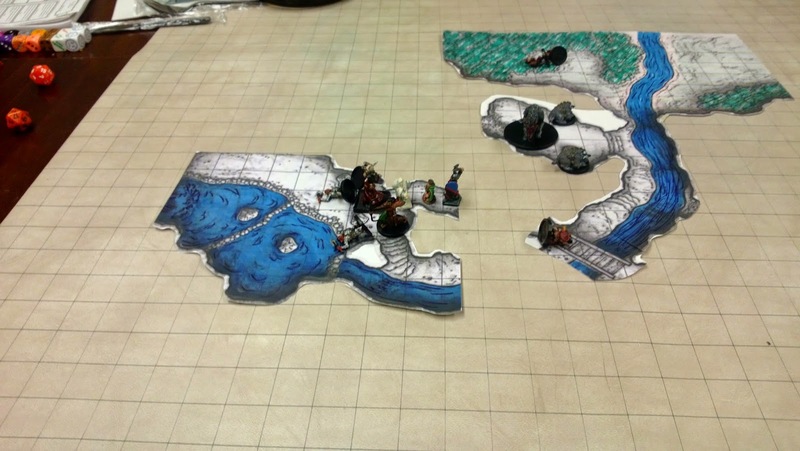 The group cleared out the rest of the Hideout, and saved the captive, Sildar, rather heroically. When confronted with the Goblin leader's threat to kill the captive, the Folk Hero hesitated but the Noble Fighter stepped up and threw a javelin (I had allowed some adjustments to equipment for the pregen PCs). It scored a max damage hit, killing him outright. I thought to have the rest of the Goblin surrender but they fought on briefly, several being the victims of a Sleep spell, one being killed, and another reduced and captured. The party then gathered as many of the goods as they could, using the four captured Goblins as porters, and made their way to Phandalin. We played for some time, the party gathering info from many sources but knew we were pressed and didn't want to rush things overly. We've opted to do some further in-town play through our online (secret) Facebook group. It's not only a useful way to handle the logistics of our gaming but will now also be used to get in some between-gaming-gaming. This and the playouts were the shortcut approaches I alluded to early in this post and I'll have more on those in next week's blog post. Thanks for checking in! The next installment is here.